After blogging about Uno Chicago Grill beginning to offer gluten free pizza way back in January, I finally checked it out today! The pizza was very well sized, with six slices. 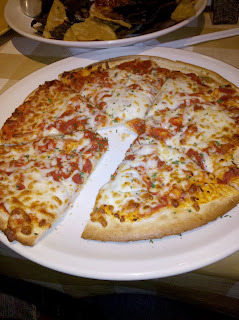 Uno Chicago Grill is known for its deep dish pizza, but the gluten free pizza is a thin crust. A very thin crust. It's unfortunate that so many gluten free pizzas fall prey to the trap of creating extremely thin crusts; Mozzarelli's comes to mind as one gluten free pizza restaurant that escaped the too-common trap. While I didn't particularly mind the thin crust, the flavors at Uno's weren't particularly compelling. I ordered the cheese & tomato and was underwhelmed. My friends Arpan and Anjali and I agreed that there was not enough sauce on the pizza and that overall, the pizza was pretty bland. While it was nice to have an option while my friends ate gluten free pizza, I certainly would not seek out Uno's gluten free options when there are so many better options in the L.A. area. Again, while it's nice to have the option in a nationwide restaurant, it is not a place that I would regularly eat gluten free pizza. Uno's also offers an entire gluten free menu that includes appetizers, desserts, burgers, and other entrées. The primary menu clearly notes that gluten free eaters should ask for their special gluten free menu; it's always great to see nationwide restaurants catering to the Celiac and gluten free crowds. Note: This is currently the only Southern California location. For other locations, click here.